There are a number of old directories which contain varying detail. Those which are out of copyright will be transcribed and placed in our Directories page. Permission will be sought for the remainder. They are not huge tomes like those we are familiar with today, which are useful for weighing things down, some are very small indeed and may prove impossible to photograph, in which case they will have to be transcribed on site and that will take some time. We aim to eventually have the whole run of the directories transcribed. From the records detailing the holdings of the RG1 series (Colonial Period) in the MNA we have created our own database of files which we believe to contain biographical material. A list of names and files are now available. Below are a few samples of this unique material. We have collected quite a number of photos of headstones and memorials and will continue to do so. 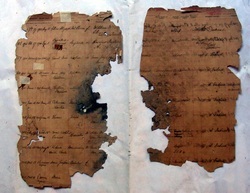 ​​Extensive collections of church registers still survive in Burma though many are in a decaying state due to acidic inks, insects and Cyclone Nargis. We have transcribed quite a number of these records. As of 2015, we are aware that they are being preserved.